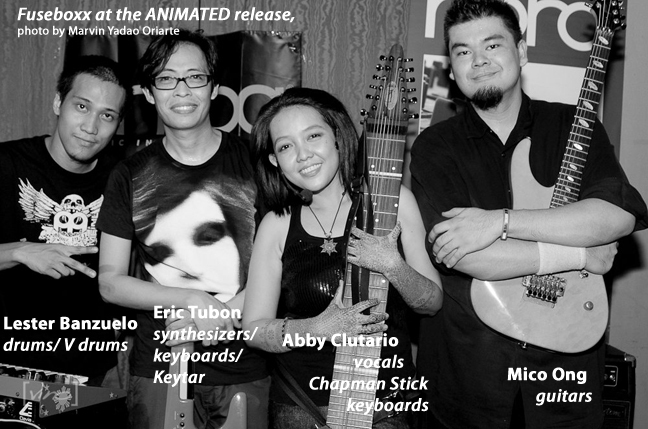 A musical pioneer on so many levels, Stickist/vocalist/keyboardist Abby Clutario fronts the powerful Filipino progressive rock band Fuseboxx. There aren't many progressive rock bands in The Phillipines, nor are there many prog bands in the world that are fronted by a woman vocalist (singing in Filipino and English at that). And though the number of women playing The Stick continues to rise, they are still a definite minority. Novelties are not what you'll notice about this band, but rather their unique sound and powerful performances. It's great to hear a compelling vocalist, weaving her own bass and melody lines into such a lush and layered sound. Fuseboxx's chemistry is undeniable. Though Abby's move to The Stick is fairly recent, her visual and sonic presence with the instrument is as natural any veteran player's. 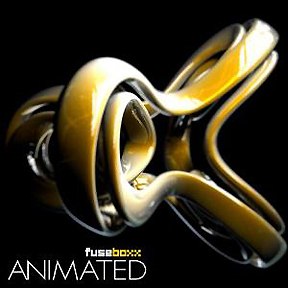 Fuseboxx has just launched their second release, ANIMATED, to enthusiastic reviews and fan reaction. I was able to chat via Facebook with the Abby about her new role in the band and future plans with The Stick. August 26 - Gigph at URFaceRadio. SE: Tell us about how you brought The Stick into Fuseboxx? Abby: I use the Chapman Stick for Fuseboxx mainly to support the bass end of the music. Fuseboxx had a bassist until 2008-2009 but when the last one decided to leave, I was kinda forced to bring the Chapman Stick to Fuseboxx as insisted by my bandmates. Most of the arrangements for the songs in the 2nd album were changed for me to manage still doing some of the keyboard parts and singing at the same time. SE: Did you ever play the bass before? 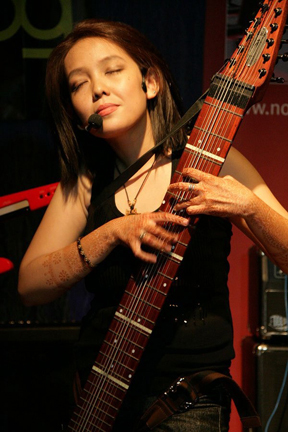 Abby: I had no bass guitar experience but I was playing the piano as my main instrument for Fuseboxx (since 2001) and other groups so I guess the learning curve in terms of "linear" aspects and tuning per se was a bit easy. What was a bit interesting is that when I got the Stick nearly three years ago, I studied it in two aspects, one is coming from the methods in your Stick Book and Bob's videos, and the other one is trying to look on my own for the bass lines in Fuseboxx which I could easily cling on to. I know I haven't maximized yet the flexibility of this instrument, and I know I still have a lot to learn. In three years, I am beginning to feel that there are certain Stick bass patterns that I am at home with and that I should explore more possible patterns and get away from those "comfort zones" for my own musical growth. SE: How is singing with The Stick different than with other instruments? Abby: I was very used to singing while playing the keyboards cuz I can already play "mechanically" with the keyboards. But when I had to sing with the Stick, it was all different, especially at the beginning. Before, my focus was in the voice and the piano was kinda automatic. When I was singing with The Stick, I had to focus with that but my voice didn't catch up automatically. Some vocal parts for Fuseboxx were quite challenging and I needed to focus more on those parts. Before I was ok with singing with a boom mic stand, but it was quite difficult because I haven't memorized the fretboard yet, I had to look at it from time to time. That's why I decided to use a wireless mic so that I didn't need to think about losing the mic when I had to look down. It's like what you said in your article or post I read once about multi-tasking. You'd really have to master first how to change your focus point so that you won't get lost. SE: I noticed you playing two-handed parts on the bass side in your video. Did you ever do that kind of thing on the keyboards, or is this a new way of looking at music for you? Abby: Oh, it was definitely a new way for me! I didn't play a bass guitar ever before, but I knew some basic bass lines to play in the piano. But since I needed to catch up with the bass lines and tutti parts in our songs, I had to find a way to do it, though I can build chords easily if I combine at least two fingers with both bass and melody strings. I suppose many Stick players also use this technique or style a lot? SE: Have you started writing any new music that is based on Stick playing rather than adapting parts from other instruments? Abby: I plan to have a solo album after the promotion of ANIMATED featuring the Stick as a main instrument. Most of my friends who have seen me play with the group want to see it with me solo. I have started on some arrangements of traditional filipino songs, some covers and new material. I believe I am the only one here in the Philippines who is using the Chapman Stick actively. If there are others, I don't know of anyone as of the moment. 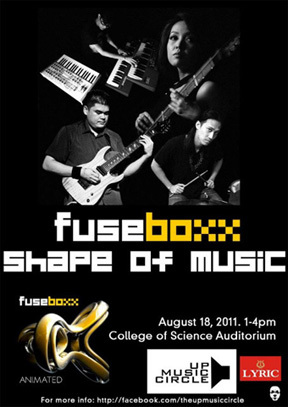 Fuseboxx also, is one of the live acts here in the Philippines who has introduced Progressive Music way back in 2001. SE: Looking forward to your solo project, and good luck with ANIMATED.